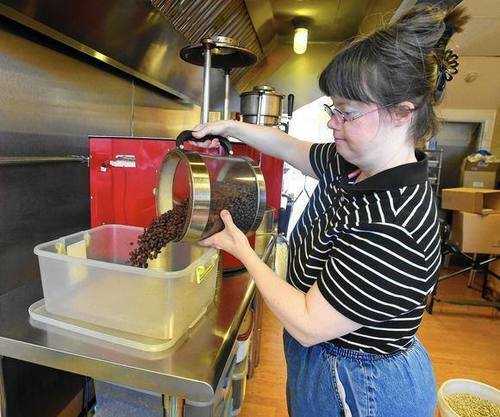 Furnace Hills Coffee™ has a commitment to hire people that are developmentally disabled. Meet Erin Baldwin, Not only is she our first employee, but she's our Chief Roaster as well. Erin has down syndrome but that hasn't stopped her from doing something that she loves. Although she is challenged in how she lives her life in a number of areas, she loves to roast coffee and is doing a great job at it. She has been so great in fact, that she has inspired the phrase "Special Coffee Roasted by Special People". As our company grows, we strive to hire more people with developmental disabilities. We would like to introduce you to Chris, he is one of our coffee roasters. Chris has autism but he doesn't let that stop him, he loves working at Furnace Hills. Chris can be found most weekends watching NASCAR and is saving up to one day go to the Daytona 500. Chris also has the best handwriting of any of us, so he also helps us out by doing all the writing on our chalkboard signs. We hope that Chris is just the second in a long line of people with developmental disabilities that we hire here at Furnace Hills as we continue to grow. So if you're in the area, feel free to stop by and say hi to Erin or come talk NASCAR with Chris. We would all be happy to see you and you can enjoy a cup of freshly roasted coffee while you visit. In addition to employing people with developmental disabilities, we also sell a couple different blends of coffee to raise money for specific organizations that work with people with developmental disabilities. We have partnered up with the National Down Syndrome Society to provide our Buddy Walk Blend of coffee. For each pound of Buddy Walk coffee that we sell we donate $5 to the National Down Syndrome Society to help fulfill their vision of helping all people with Down Syndrome have the opportunity to enhance their quality of life, realize their life aspirations, and become valued members of welcoming communities. We have developed a few different blends of coffee for The Arc to help them raise money for their mission of promoting and protecting the human rights of people with intellectual and developmental disabilities. The Arc is the nation's leading advocate for all people with intellectual and developmental disabilities and their families and the premier provider of the support and services people want and need.